A report released yesterday in the journal Scientific Reports found “substantial probability” that the eastern population of monarch butterfly could be wiped out in a “quasi-extinction” event in the next two decades. 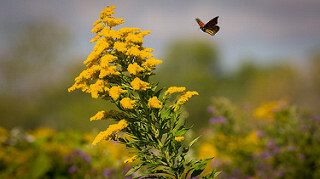 The study attributed the increased likelihood of an extinction event to extreme weather, which has historically posed a threat to monarch populations. But the study also noted that the most recent declines have been primarily caused by the eradication of milkweed from farms in the United States. Despite the results of this report, I am convinced that we can save the monarch.